Woman looking at empty blank copyspace. Pensive thoughtful young girl in hat and red sweater thinking wondering. 4K ProRes HQ codec. 4k00:16Woman looking at empty blank copyspace. Pensive thoughtful young girl in hat and red sweater thinking wondering. 4K ProRes HQ codec. 4k00:11Woman looking at empty blank copyspace. Pensive thoughtful young girl in hat and red sweater thinking wondering. 4K ProRes HQ codec. 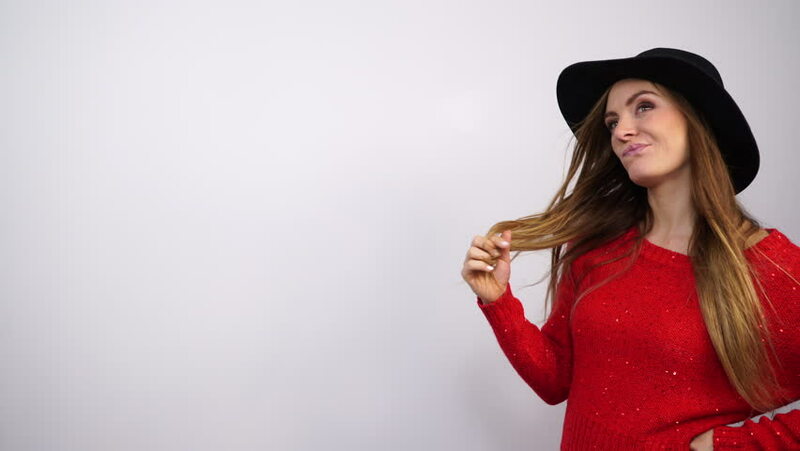 4k00:13Woman in black hat and red sweater. Smiling fashion young girl 4K ProRes HQ codec. 4k00:13Woman in hat making mustache from her hair. Happy playful girl having fun. 4K ProRes HQ codec. 4k00:13Woman looking at empty blank copyspace. Pensive thoughtful young girl in hat and red sweater thinking wondering. 4K ProRes HQ codec.